Machine Movers Factory Removal & Relocation. 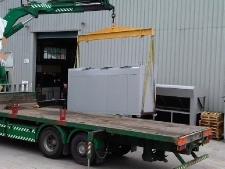 We are dedicated to the professional relocation and transport of all manner of industrial and factory equipment. Over the years we have provided the know-how for a wide variety of complex business relocations. 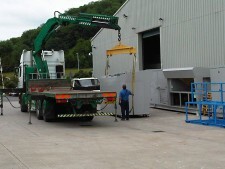 We can move all manner of machine with our standard moving technologies moving machinery up to 10,000 kilograms. We can move heavier items with consultation and site surveys. Site surveys are recommended just to make sure we can do what you require as quickly and efficiently as possible. Our expertise in moving mission critical technology enables you to get on with what you do best with minimal interference whilst moving machinery around your premises or between locations. We know you need your machines to do what you do, and our goal is to get you back up and running as soon as possible. 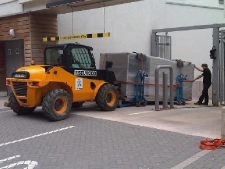 Our expertise in the area of machine moving takes all the worry out of relocating your valuable equipment, you know that you're in safe hand when you use Specialist Lifting Solutions for your machine moving. We know how expensive (in monetary value and importance to your business) your equipment is and our comprehensive insurance cover makes sure your machines are covered in every eventuality. Our fully compliant operatives all hold CSCS and CPCS qualifications (where applicable) and all follow a strict method statement to make sure we comply on all necessary regulations. When we move your machines we always follow a strict pattern of events to ensure the quality of our work. First we like to perform a site survey to make formulate a plan to move your machinery. Once our surveyor has created a plan for the work you require, we complete a risk and method statement. The documents created follow our company policy to protect both any personnel you may have on site and our own, complying with all health and safety policy relevant to the machinery you require moving. As a specialist in machinery moving we make sure this plan is followed from inception to completion to protect everyone involved, we take health and safety seriously at Specialist Lifting Solutions. Once we are happy that we can carry out all the requirements correctly we carry out the work to our stringent standards all lead by a team leader monitoring and controlling the work. We provide our services in the following locations; Swindon, Cirencester, Stroud, Tetbury, Nailsworth, Malmesbury, Oxford, Cheltenham, Bristol, Chippenham, Hereford, Birmingham, London, and greater london, Cardiff, Worcester, Newbury, Wiltshire, Somerset, Bath, Corsham, Trowbridge, Gloucester, Coventry, Surrey, Wokingham, Solihull, Reading, Guildford, Yate, Devises, Maidenhead, Uxbridge, Fichley, Croydon, Buckinghamshire.